The unmarked entrance to one of the three Abbey Caves. One popular attraction in New Zealand is the glow worm caves. In Whangarei, where we were cow-sitting, there was a free, city-owned reserve with three caves (zoom the map below for the exact location). 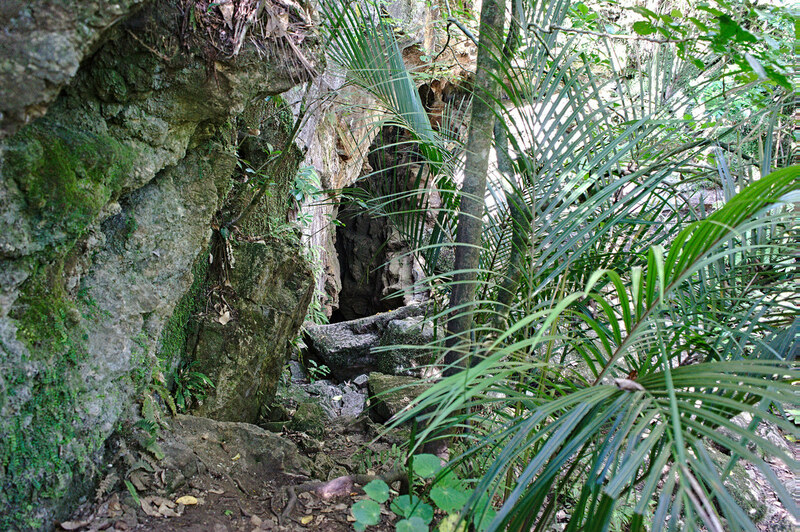 The trails leading to the caves are well marked but the caves themselves are off the beaten path and undeveloped. It’s even a bit of a challenge to find the entrances to the caves since they’re not signed and are somewhat hidden. The hundreds of fine rock layers paint beautiful walls. 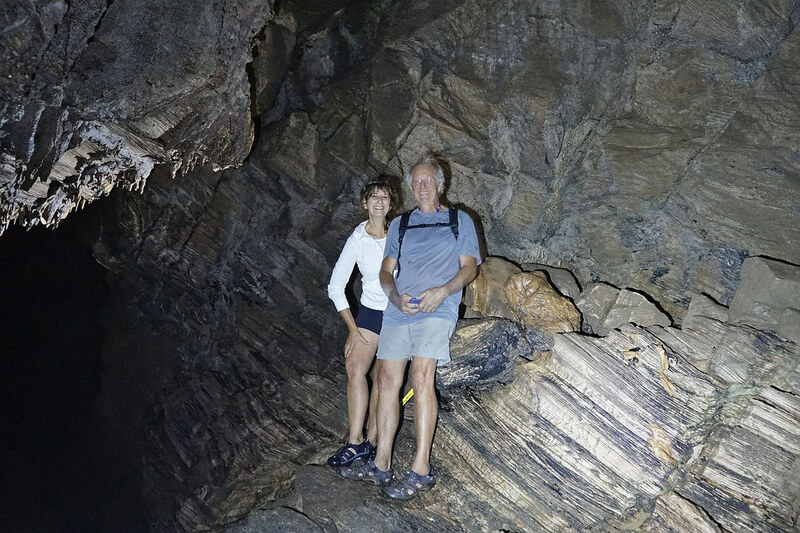 We climbed down into the Organ Cave over huge boulders and followed the stream of water into the belly of the cave. The interior of the cave was striped with many fine layers of limestone rock. The rich color of the layers fascinated us. As another travel author described the orange layered stone, it was like being on the inside of a Bengal tiger. Wading through the water, we came to a cavernous space which gave the cave its name. Large stalactites hung from the ceiling and walls like an old church pipe organ. When we turned off our headlamps and our eyes adjusted to the dark, we were mesmerized by the stars of pale blue bioluminescence, the glow worms twinkling above us. 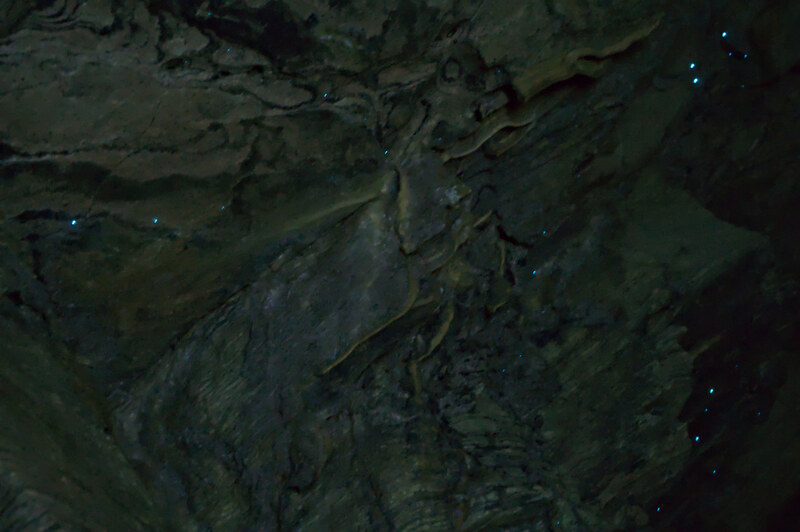 Glow worm stars in the Abbey Caves. Glow worms are not actually worms. They’re the larvae of a particular fly that loves damp places. The popular fire fly is its cousin. Distinct stone outcroppings make the Abbey Caves hike interesting. The nice thing about the Abbey Caves reserve is that the trails are a nice nature walk void of any crowds. There are hammocks of native bush and large outcroppings of stone. There are rock chimney remains of the original settler’s home on the property; a pioneer family in the late 1800’s. 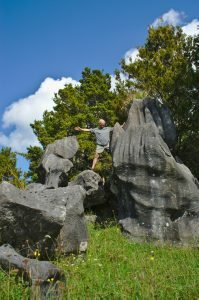 Or you can visit the famous Waitomo Glow Worm caves, a standard tourist attraction teeming with tour buses, entrance fees, souvenir shops and groomed trails. Previous PostMagical CastlepointNext PostMeat Me at Mzoli’s! Now that is the type of things I like to see. When I was in my late teens I went into one of the undeveloped limestone caves at Mount Etna near Rockhampton north of Hervey Bay. Definitely not the type you would go into without an experienced caver with you as there was one spot where the tunnel was so small you had to lay on tummy and wiggle like a snake to get through into a gigantic cathedral cave. Abolutely cool, but definitely not for the clostrophobic personality. Love your posts. Ha! I’m not sure I would be so brave, but Deena is more adventuresome and spent a semester in school studying bats. I just followed her! Of the three Abbey Caves, one of the other ones is a walk-through. It has a low ceiling but not “get on the tummy and wiggle” low. Then you crawl out at the other side.